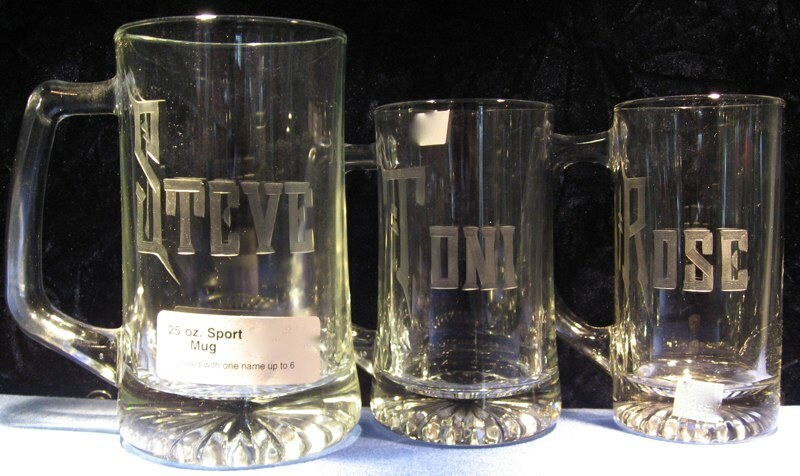 Jeff and Sherrie Sowers are owners and engravers of Sowers Glass Engraving . 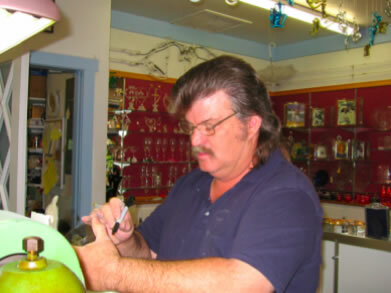 Jeff Sowers has been personalizing glass and crystal for over 30 years. 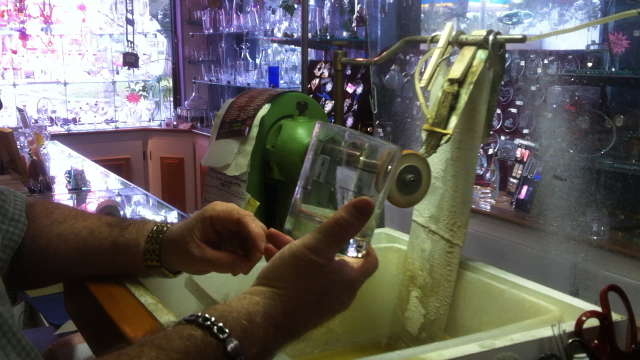 Jeff is one of a very few that are able to engrave using a Spatzier for engraving on glass. 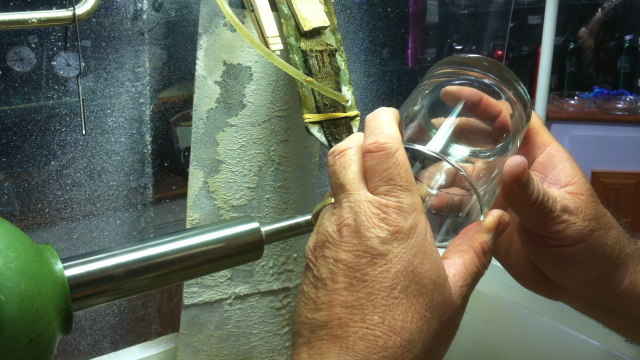 The Spatzier is also used by the engravers at Corning Glass in New York. This kind of engraving is know as stone wheel engraving or copper wheel engraving. Stone wheel engraving is an ancient technique that uses a spinning stone wheel to cut letters and patterns into crystal and glass. 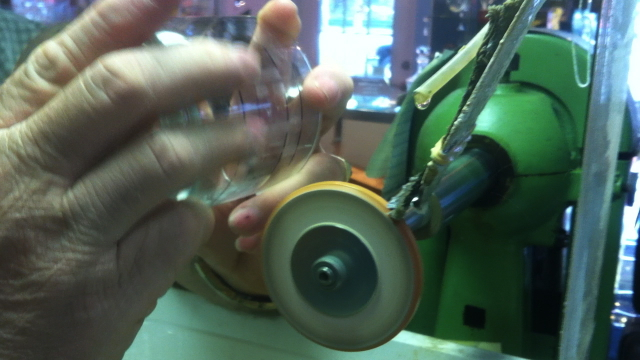 With this type of engraving the engraver maneuvers the piece of crystal over the wheel, often holding the piece upside down and backwards while looking through from the opposite side. This technic is often referred to as glass “cutting”. 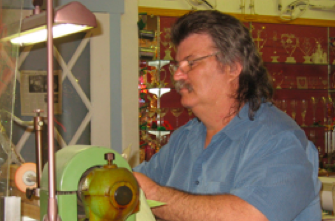 Jeff uses a man made stone wheel that he “dresses” or sharpens using a special diamond dressing tool. It takes great skill to be able to sharpen the stone wheel. With computers replacing humans hand wheel engraving is now considered to be a lost art. Each item engraved a truly unique piece of engraving. 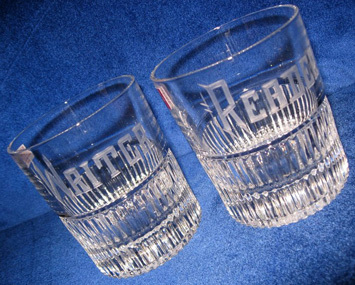 Each name or design is cut into the glass by hand. Jeff takes great pride his work. 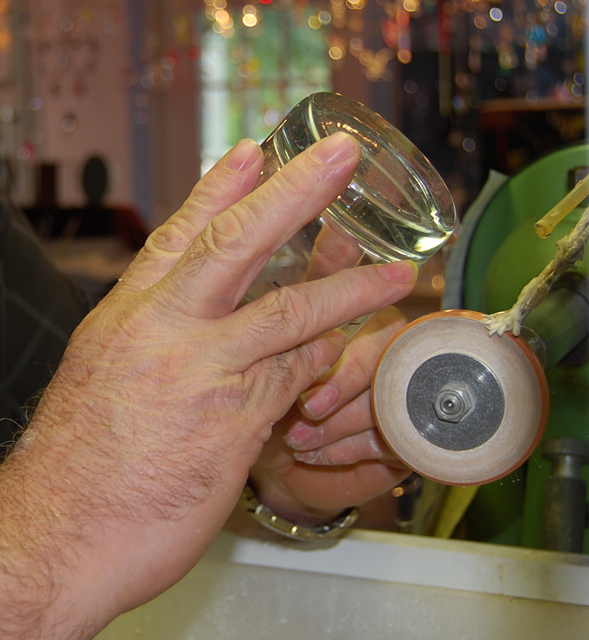 Below are some close up photos of Jeff engraving on his Spatzier lathe "wheel" glass engraver. Sherrie Sowers has also been engraving for 24 years. She does her satin etching by hand as well. The twelve inch round plate on the right was created by both artists. The names and other lettering is a calligraphy style of hand lettering done by Sherrie. There are roses on the plate that were wheel engraved. Sherrie has engraved on items that are not able to be engraved by other means. Like hand blown thimbles, as well as all the way around the rim of a Waterford Crystal ice bucket, or a Margarita glass, or a thin Christmas ornament. 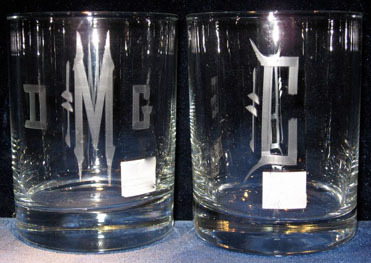 We also offer engraving on many items that can not be engraved by computers or lasers. Each day brings a new challenge. 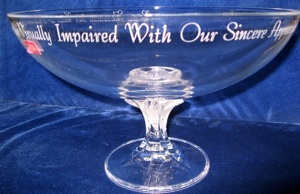 We can engrave around the rim of bowls, champagne glasses or any of our glasses as shown below. 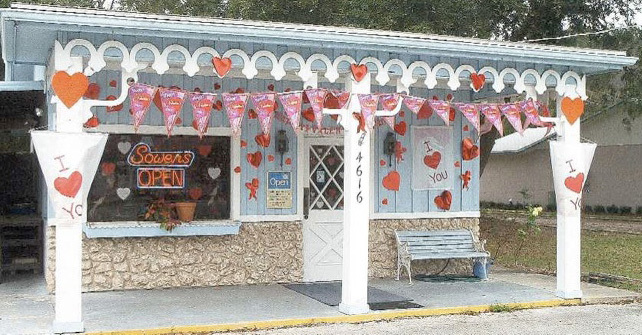 Our business is located in Port Orange, Florida. All of our engraving at done in our Port Orange store located at 4616 Clyde Morris Blvd. Ours is a real brick and mortar store. 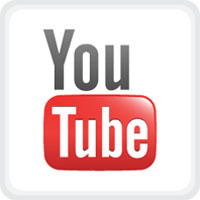 Check out our map page we have included a google map so you can find us if you live in Port Orange, Daytona Beach, Edgewater, Palm Coast, New Smyrna Beach, Ormond Beach, Deland, Deltona, or Orange City, Florida. 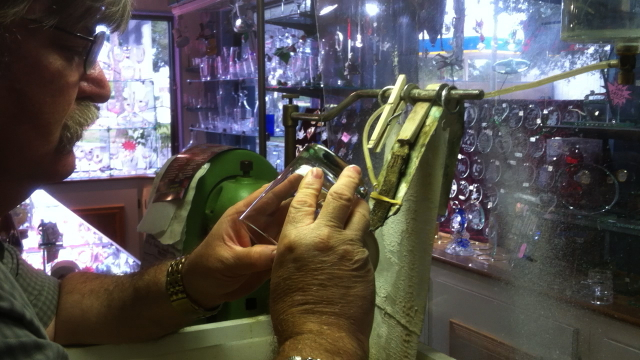 Sowers Glass Engraving is a real brick and mortar store. 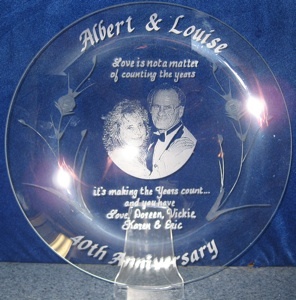 We have a large selection of glass and Crystal items that you may choose from like wedding glasses, beer mugs, wine glasses, clock, frames, vases, and awards. We also can engrave on many metal items that can not be engraved by computers or lasers. You can bring in lighters, urns, knives, jewelry, coins, frames etc.